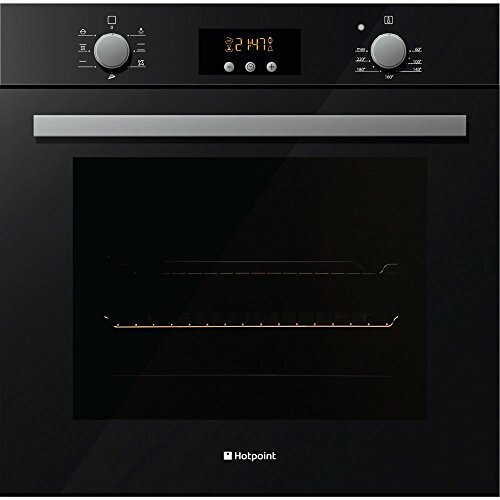 Hotpoint Built-in Multi-Function Electric Single Oven in Black, Energy Rating A. Model: SA2540HBL Stylish design Electronic clock Programmable digital display timer Easy to clean interior with easy-clean enamel Double glazed viewing windows Interior light Multifunction oven with 2 shelves Full width variable grill Comes with a 3-pin UK plug that goes into a socket in the wall Size H595, W595, D551mm Manufacturer's 1 year warranty. Colour of knobs could be different (black). Excellent addition to any kitchen.